Sharon Fox-Mould is a fine artist whose medium includes acrylic on canvas and photography. Sharon’s Hibiscus won second prize in UTRECHT 60th anniversary art competition in 2009. Sharon Fox-Mould is a Past President of The Jamaica Guild of Artists and a proponent of the philosophy that artists working in community will build strong technical skills, strengthen their concepts and product delivery. A graduate of The State University of New York, Sharon double majored in Psychology and English. 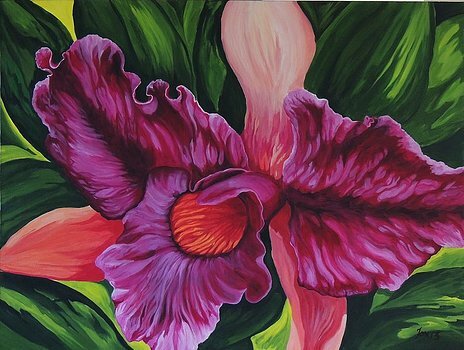 After living in the United States for 15 years and pursuing a career in administration and education she reacquainted myself with my Jamaican roots and began painting the flora of Jamaica. She has never given up her passion in life for painting. Sharon’s chosen medium is acrylic on canvas but she often strays to furniture and walls. Sharon Fox-Mould has participated in many exhibitions mounted by the Jamaica Guild of Artists. As a guest of the National Museum and Art Gallery of Trinidad and Tobago and the Mayor of Port of Spain, she exhibited in “Celebration of Jamaican Art Exhibition”, which marked the anniversary of the twinning of the cities of Port of Spain, Trinidad and Kingston, Jamaica. Her paintings joined those of esteemed African American artists at the National Black Fine Art Show at the Puch Center in New York City. Sharon has also participated in the Columbia Arts Festival in Columbia Maryland as an invited artist. Her work is widely collected by individuals and corporations in Jamaica, United States and Canada, especially notable is the prestigious Pehl Collection in Eldersberg, MD, the Vincent D’Aguliar Collection in Nassua, Bahamas, and The Bank of Jamaica Collection.